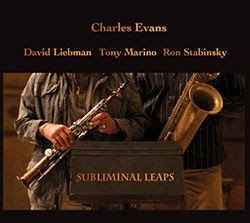 With his teacher's signature soprano sax in mind, Charles Evans, a student of David Liebman, carefully crafted Subliminal Leaps, a set of both composed and freely improvised music. The considered combination of Evans' baritone and Liebman's soprano saxophones is ably accompanied by pianist Ron Stabinsky and bassist Tony Marino. The album is the result of a live performance recorded at a church in Wilkes-Barre, Pa. The pieces are generally abstract compositions that really take advantage of the timbers and textures of the instruments. I wonder how these songs would sound without the upper ranges and insistent pitch of the soprano sax and the woolier baritone, as the contrast of the instruments add much to the actual compositions. The other two instruments are important as well -- Stabinsky provides wonderful and often understated support while Marino's bass helps ground the abstract tunes, both leaving lots of space for the woodwinds. The opening 'Dreamed-out March' features a long improvisational section for Evans and Liebman to spar and play, only to be brought back to a playful sequence from the rhythm section. 'Certain Soprano' is a showcase for Liebman, where he concentrates, at least at first, in the instruments middle register. In "Mahler Method" the projection of the two horns against the subdued piano lines is rather breathtaking. Another highlight is the uptempo passages followed by the atmospheric explorations in the title track in which all of the players reach for the outer limits of their instruments, experimenting with staccato bursts and wailing tones. Subliminal Leaps is a sophisticated study in the contrasts of harmony and tonality, as well as a compelling combination of classical composition and free improvisation. This is one that could really stand repeated listening, as every time I do, I find something in it that I had not heard before.